RxSorbo, leading online retailer of top-rated running shoe insoles, issues a response to the end of the `barefoot’ style running craze. The company supports options for customers, including both barefoot running and insoles. Exercise fads are nothing new, and the running world is in no way exempt from what is a natural human tendency. RxSorbo, a leading online retailer of top-rated running shoe insoles, is pleased to issue a response to the recent running craze for `barefoot’ running in the form of this public press release. RxSorbo has never strayed from the business of protecting runners’ feet, despite recent fads to the contrary. The company supports both options and encourages runners to experiment, and choose the option best for them. By issuing a public press release, the company hopes to raise awareness during the busy September - October season about the choices available to consumers, ranging from barefoot running shoes to complete insoles. Confused customers are encouraged to reach out via the Website for assistance. There is a danger of one running-shoe fad replacing another. As one recent headline put it: “Forget Barefoot; New Trendsetter in Running Shoes Is Cushioning.” Athletes who spent the past few years embracing barefoot running are now being asked to consider shoe construction as the other extreme. Recently growing in popularity are “maximalist” shoes that have chunky, heavily cushioned soles. Are the sport’s new wonder product? Or is the pendulum swinging, and swinging too far, in the other direction? The point of this public statement is to encourage consumers to do individual research, and choose the best option for them. 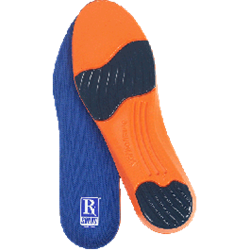 To browse available insoles for walking, one can visit the following URL: http://www.rxsorbo.com/insoles/running/. There, one can browse the company’s classic heel pads, classic insoles, and the all whole line of running shoe insoles.